Planting InstructionsSemi shaded area is best. Winter CareA winter mulch around the base is advisable in colder climates. Foliage TypeLeathery, sickle-shaped leaflets in light green. Soil RequirementEvenly moist, well drained soil. Additional InformationThe species is named after Robert Fortune the 19th century Scottish plantsman who was the first westerner to describe a great many species. 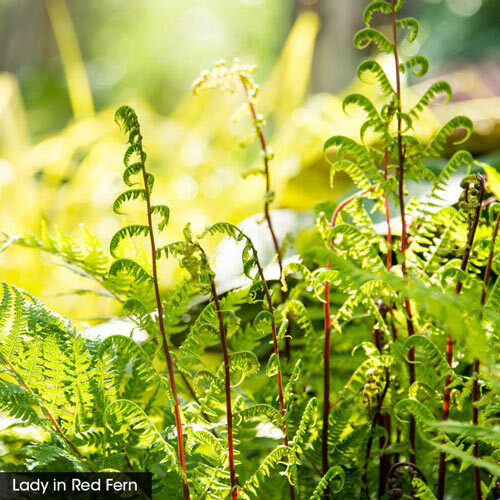 Unique CharactersticsVery regal looking holly fern that will tolerate colder weather. 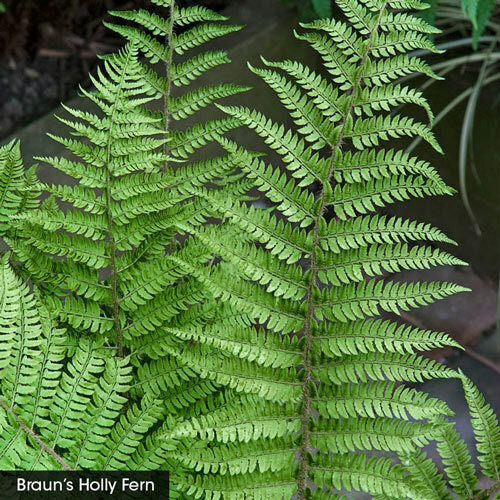 Light green fronds have an upright clump forming habit . Good companion to hosta or other shade loving perennials. Soil RequirementWell-drained, humus enriched, moisture retentive soil. Watering RequirementRequires regular watering, weekly if not more. Be sure to keep soil moist. 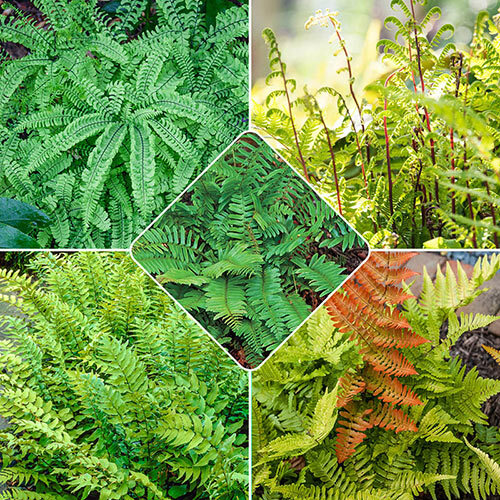 Unique CharactersticsDramatic foliage colors, easy to care for, makes a great gift plant, great for smaller gardens, great for zen or rustic style gardens, eye-catching foliage, frost tolerant. Tolerant to rabbits. Performs well in Heavy shaded areas. Unique CharactersticsRed stipes (stems) Light green leaves are great contrast for bold leaf shade plants, and red stipes. 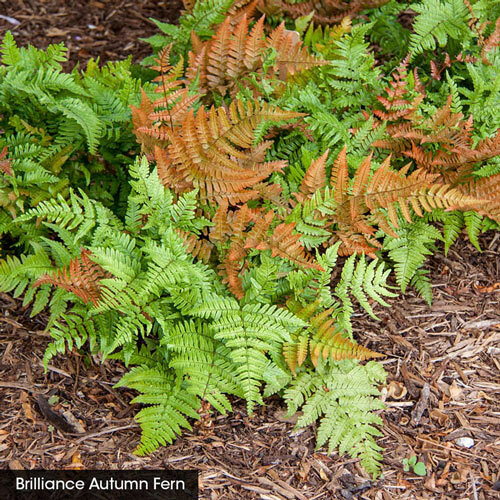 Foliage TypeFronds are leathery, full, dark green evergreen. Lance shaped leaflets narrow to a point and form in dense clusters. Soil RequirementLime-free acidic humus soil. Additional InformationLoves deep shade where nothing else seems to grow. 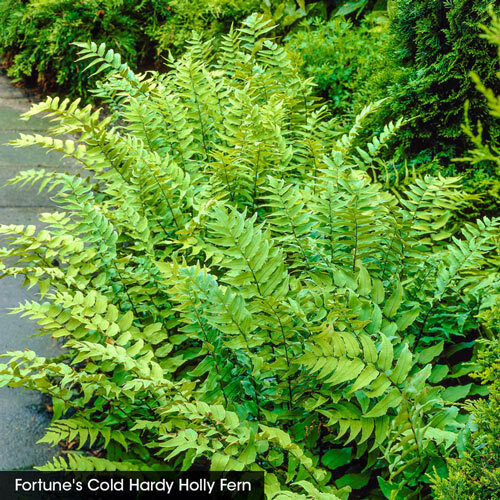 Unique CharactersticsVery hardy, rich green color, graceful airy foliage. 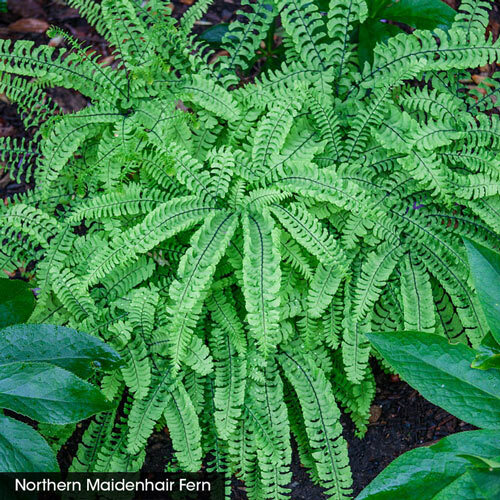 This fern was used by early settlers of the N.E. United States as Christmas Decorations.